FLORIDA – WARNING!! NEW “AS IS” SALES CONTRACT!! Beginning October 1st, if buying or selling a home, your Realtor may be writing your contract on the new FloridaRealtor/FloridaBar-ASIS-1 “AS IS” SALES CONTRACT. In an “AS IS” contract, a buyer has a “stated” amount of days in which to have inspections of the Property performed. According to the contract, “If the Buyer determines that the Property is not acceptable, he/she may terminate the Contract by delivering written notice to the Seller prior to the expiration of the inspection period.” It also states, “If this is done in a timely manner, the Buyer’s deposit shall be immediately returned. Unless the Buyer exercises the right to terminate, they will accept the Property in it’s “As Is” physical condition.” CAUTION: The new ruling also states, the Buyer will accept violations of government, building, environmental, and safety codes, restrictions, or requirements. So, if you are buying a home, be sure that within your inspection period, you have made sure there are no liens, violations or open permits on the house, because it’ll be too late when you get to the closing table!! HOME FOR SALE! ISN’T PRETTY…BUT..IT’S PRICED GREAT AND CAN BE MADE FABULOUS! A LITTLE LUVIN' FOR PERFECTION! 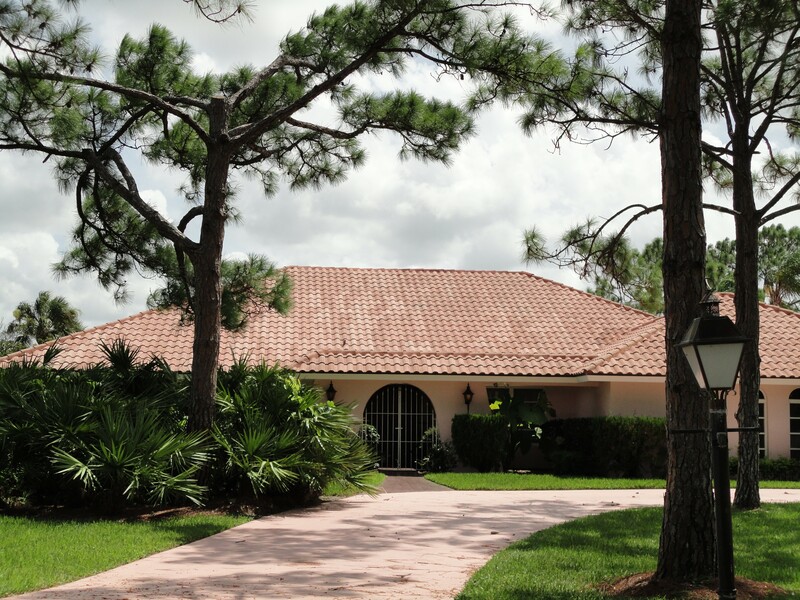 THIS HOUSE, ALTHOUGH IT NEEDS UPDATING, SITS HIGH ON A BEAUTIFUL TROPICAL 1 ACRE CORNER LOT, HAS SPECTACULAR GOLF COURSE VIEWS, IS LARGE AND SPACIOUS, AND HAS A DRIVEWAY THAT SPRAWLS FROM ONE STREET TO THE NEXT. THE LAYOUT IS WONDERFUL, WITH 3216 SQ. FT. OF LIVING SPACE, HIGH VAULTED CEILINGS, FORMAL LIVING AND DINING ROOMS, A SPACIOUS KITCHEN THAT OPENS TO A LARGE FAMILY ROOM WITH WOOD-BURNING FIREPLACE, A “SUPER SIZED” MASTER SUITE WITH 2 WALK-IN CLOSETS, HUMONGOUS SHOWER, SOAKING TUB AND SLIDING GLASS DOORS. THERE IS AN OFFICE WHICH WOULD EASILY ATTACH TO A BATH FOR A 4TH BEDROOM. TWO ADDITIONAL BEDROOMS SHARE A BATH AND ARE LOCATED IN IT’S OWN PRIVATE WING. 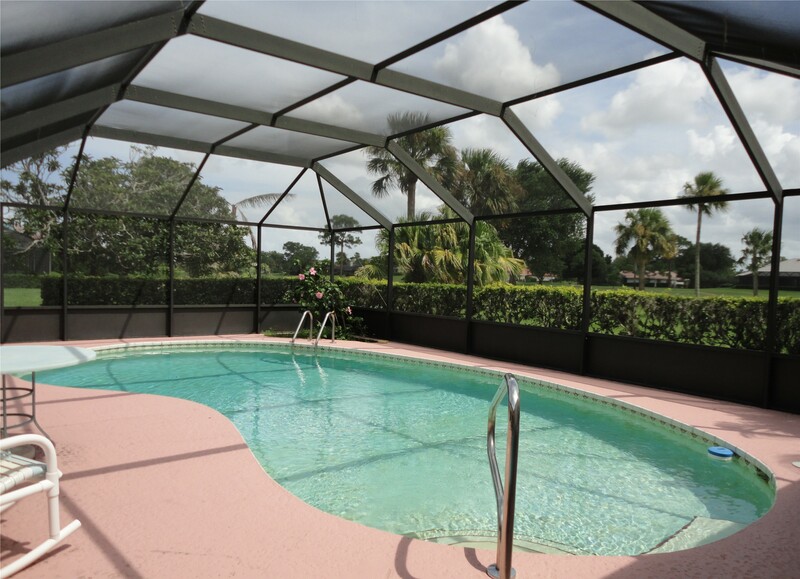 AN X-LG FLORIDA ROOM OPENS TO A SCREENED SOLAR-HEATED POOL AND FANTASTIC VIEWS! IT HAS A 2 1/2 CAR GARAGE AND IS SURROUNDED BY A PLETHORA OF TROPICAL FOLAGE. IT IS BEING OFFERED AT $299000. THE NEIGHBORHOOD IS WONDERFUL! IT’S LOCATED IN PALM CITY’S “HIDDEN JEWEL”…THE BEAUTIFUL EVERGREEN CLUB, WHERE YOU’LL FIND 300 UNIQUE CUSTOM HOMES ALL LOCATED ON BEAUTIFUL 1 ACRE HOMESITES. AN 18-HOLE CHAMPIONSHIP GOLF COURSE MEANDERS THROUGHOUT THE COMMUNITY. CLUB MEMBERSHIP IS NOT REQUIRED IN ORDER TO LIVE IN EVERGREEN…BUT THERE ARE DIFFERENT MEMBERSHIP PROGRAMS TO ACCOMMODATE ALL HOUSEHOLDS. THE HOMEOWNER’S ASSOCIATION FEE IS MINIMAL…$2145/ANNUALLY WHICH INCLUDES OUR 24-HR MANNED GATED ENTRANCE, COMMON GROUNDS, AND BASIC CABLE. THE LOCATION IS WONDERFUL…CLOSE TO I-95, THE TURNPIKE, THEATER, RESTAURANTS, SHOPPING, HOSPITALS AND PALM CITY’S “A” RATED SCHOOLS. EVERGREEN CLUB IS A GREAT PLACE TO LIVE…A WONDERFUL PLACE TO CALL HOME!! PLEASE CALL MICHELE 561-262-3300 MDUTKIN@AOL.COM FOR FURTHER INFORMATION! The 1 acre corner lot, with it’s spectacular golf view, is fabulous….the house is LARGE…3216 square feet of living space, with 3 bedrooms, plus an office and 2.5 baths. The ceilings are high and vaulted. The kitchen is spacious with wood cabinetry….the master bedroom is HUGE…but…the lime green carpet through-out the house has to GO!! This is the perfect house for someone who is looking for a special home…and a project. There is 32 x 11 Florida Room that would be so fabulous if someone removed the doors between the living room and the Florida Room. There is an over-the sink window in the kitchen that opens to an eating bar in the Florida Room. Just needs some granite or corian. The family room has a wonderful stone fireplace…but..once again…those lime carpets!! Two bedrooms and one bath (cabana) share a private guest wing. The office or 4th bedroom is attached to the largest poweder room I’ve ever seen. Put a shower in and attach it to the office/4th bedroom for an additional guest suite. The pool is solar heated….and large…but..needs resurfacing. The laundry room and 2.5 car side loading garage are OVERSIZED!! The neighborhood is gorgeous…300 homes all on 1 acre property sites with a 24-hr manned guard gate. An 18 hole championship golf course meanders through-out. Golf club membership is not mandatory in order to live in Evergreen Club. Here’s my opinion….. priced at $330000…. this is a great house for the person who is looking for a large Palm City house…and isn’t afraid to undertake a project. In a neighborhood where the average price is $130.00-$140.00 per square foot, this house is priced at $102.61 per square foot. A little luvin’ and it’ll be perfection!! A simply beautiful charming home! Please call Michele 561-262-3300 or mdutkin@aol.com for further information. MICHELE’S OPINION…FIVE BEDROOM POOL HOME! ONE PRIVATE ACRE IN PALM CITY! Just put a new listing in the multiple listing today….what a fabulous house!! Concete block construction on a beautiful private 1 acre, 2908 square feet of living space, 5 bedrooms, 4 baths. Open, spacious kitchen featuring maple cabinets, a huge center island, granite counter tops and a breakfast eating area. Bright formal living room with french doors and high ceilings upon entry. Formal dining room with crown molding and chair rails….perfect for family gatherings. Large family room off kitchen. All bedrooms are oversized, but, master bedroom is especially so, with it’s sitting area and walk-in closet. One bedroom with it’s own private bath, three additional bedrooms share 2 baths. Wood and tile flooring through-out.